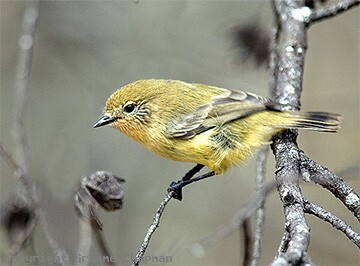 Yellow Thornbills used to be known as Little Thornbills. Usually occurring in small family groups, they forage mainly in the tree canopies and also down in the shrub layer to within a metre or two from the ground, but never on the ground. 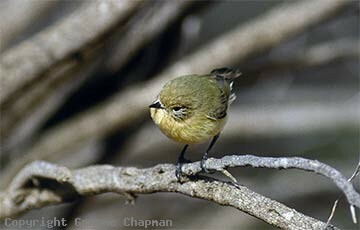 Whereas Striated Thornbills show a preference for eucalypts, Yellow Thornbills rarely do, preferring instead a range of vegetation such as Casuarina, Melaleucas, Acacias, Wilgas, and native pines. 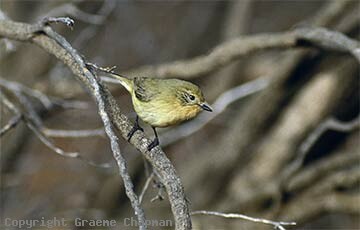 Yellow Thornbills are sedentary and once adult, remain in the same small territory the year round and may even nest in the same tree year after year. When nesting, very often only a pair attend the nest but on occasions where there are more than two birds the others may help at the nest. 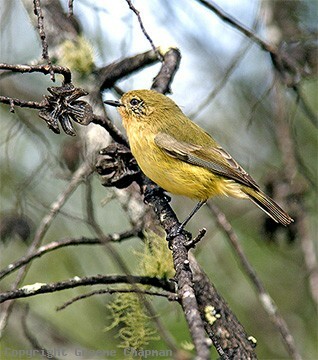 Yellow Thornbills build a very small globular shaped nest, usually placed at the extremity of a branch in the outer foliage.